HOMESTEAD, Florida – Everglades National Park, and partners including the University of Florida (UF), Florida Fish and Wildlife Conservation Commission (FWC), and the Swamp Apes (a volunteer organization), worked together last weekend to capture a Nile crocodile that was reported in Everglades National Park, in the Chekika area of the park, which is currently closed to the public. Members of the Swamp Apes, authorized agents for the exotic removal program in Everglades National Park, notified the park that they had spotted the Nile Crocodile while conducting regular Burmese Python surveys. On Sunday, March 9th, an interagency team started an operation to remove the exotic animal from the park . After several hours of corralling the crocodile into a small section of a canal, the team was able to capture the animal. Circumstances surrounding the escape or release of the crocodile are under an ongoing criminal investigation by FWC. Nile crocodiles are the second largest crocodillians in the world. 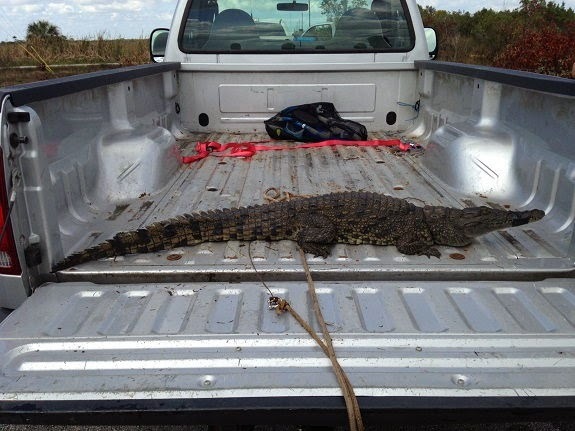 Officials say that this crocodile is a juvenile and not yet of breeding age with a total length of approximately 5.5 feet and weight of 37.4 pounds.